Living in a college town means that I have to sacrifice space for location. Last year I had my own room with a huge bed but it was a 10 minute bus ride from campus. This year, I live very close to all my classes but I have to share a room that is not even the size of the room I had last year. Our town house has 5 girls and three bedrooms. My friend KW and I share a room. KW's and I's room is pretty tiny but we make it work so we both can keep all our stuff close. I keep my refrigerator downstairs and KW keeps her desk downstairs. Our roommates' rooms are a lot bigger than ours but I am never home. 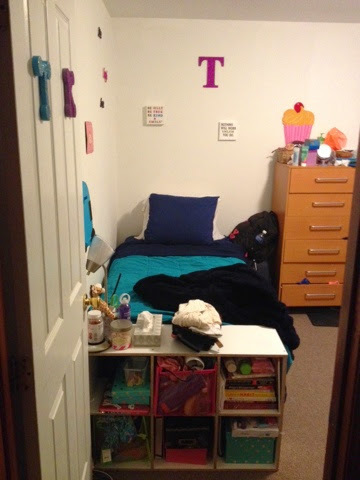 Having such a small space for the past couple years at school, I've become pretty good with organizing so I wanted to share how I made my small space work. 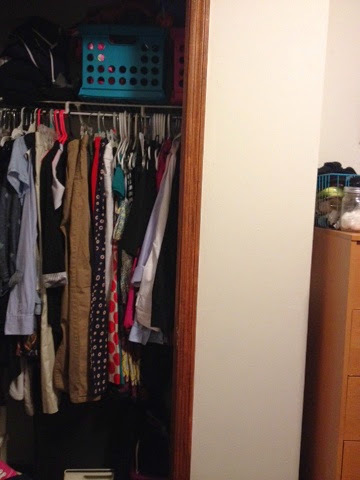 The left half of the closet is mine. I have most of my khakis. dresses, button ups and suits hung up. Anything that wrinkles badly I hang up as well. On the top shelf, I store my towels and linens in the pink bin and then I keep my purses and not used shoes in the blue bin. On the bottom, I store all my shoes in a huge bin and laundry holder next to that. Moving towards the right, I have my dresser area. I keep all my statement jewelry hung up on Command Hooks. Below I keep all my makeup, smaller jewelry, perfume and cotton pads. In my dresser, I keep my jeans, thin sweaters, t shirts and everyday clothing. I also keep my crazy amount of gym clothing in my dresser. I love having my yoga mat and a full length mirror easily accessible. Here is a closer up view of all my little things. I love keeping everything all neat and adorable. All cotton things go in my Lilly Mason Jars that I made for my bathroom last year. The big wire bin on the left is where I keep all my frequently used large beauty products. 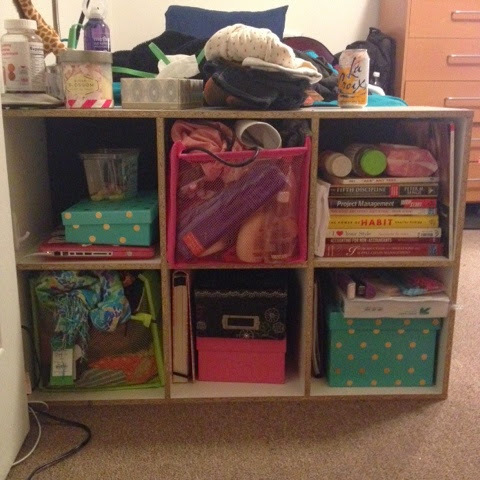 The stacked organizer in the back holds hair bows and makeup. The teal wavy bins hold perfume and face products. The teacup holds my makeup tubes and sticks. 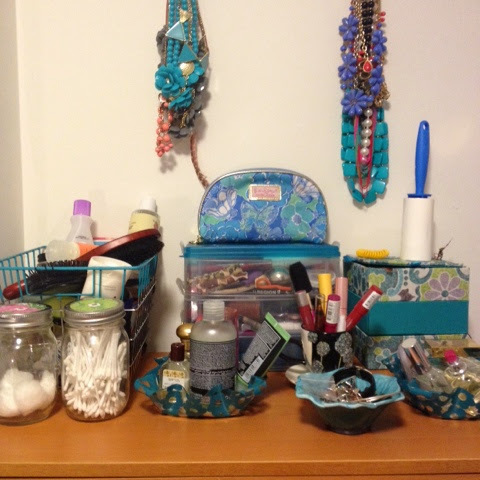 Lastly, I throw all my mostly used jewelry in the teal flower and the rest in the holder on the right. I have a lot of little art projects I made on the wall next to my bed. I hung up my lap desk for easy access next to my bed. I have a twin sized bed with all of my boots, extra beauty products and sweaters under my bed. I also have a huge stash of chips from work and any boxes I used to move into the dorm. I use 7 inch bed risers for the maximum amount of storage. I highly suggest getting the tallest ones because I always can fit all my stuff under my bed. At the end of my bed, I got this little organizer. It holds a lot of my small things. I put this together myself! Starting on the top, I keep my electronics charging in the top left, then hair stuff and hats in the middle and books/vitamins in the right. The bottom left holds scarves, the middle holds nail polish and more perfume and the right holds all my crafting and school supplies. I love how it is at the bottom of my bed and I have all my stuff close to me but still organized. 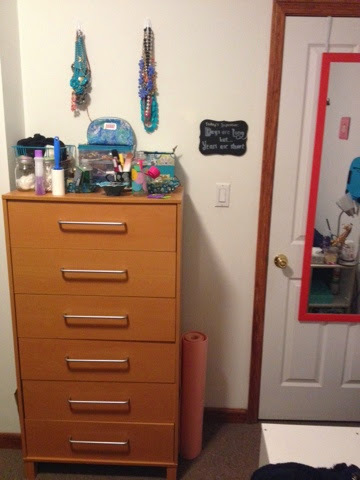 Overall, I love my how cute my room came out and I really hope you can grab some storage ideas from my method of organizing.